(but were afraid to know)! What is a chareidi and what is a non-chareidi Orthodox Jew (NCOJ)? Where does one entity end and the other begin? Who are the chareidim? Where have they come from? How long have they been here? And to where are they headed? Why do some Orthodox Jews refuse to identify as chareidi? Why do others embrace chareidi ideals? And why do some chareidim abandon them? Why are the chareidim so successful and why are they so despised? 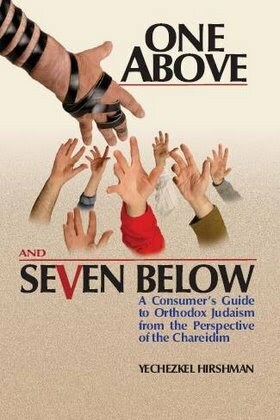 In a thought-provoking study that is at the same time theological and sociological, studious and sarcastic, insightful and inciteful, light-spirited yet profoundly intense, Yechezkel Hirshman addresses these questions while presenting an insider's look at the upside of the Ultra-Orthodox world. Click here > Preview< for a free preview of the book. Click here > Blog < to visit Achas L'Maala V'Sheva L'Matta the official 1A7B Blog!